This has the normal acanthus flowers but they are held on a spike with lots of little side spikes, giving the effect of a candelabra! 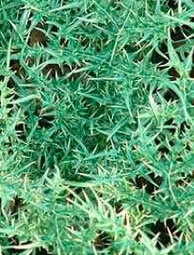 Introduced in 1886, this has a loose rosette of spiny lanceolate leaves up to 40cm long and 10cm across. Flowers in a dense spike, white often suffused rose. It has both a spread and a height of 140cm. It is debatable as to whether this is form of Acanthus spinosus but we think it has enough differences in growth to warrant a different species name. It is most likely to be A.spinosus x A. mollis. This spiny-leaved herbaceous plant was named for Pedanius Dioscorides (40-90 AD), Greek physician and herbalist who practised in Rome. He wrote De Materia Medica, a source of herbal medicinal information for the next 1,600 years. Beautiful scented pink flowers. Excellent for small gardens. 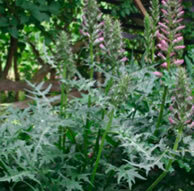 Our favourite, this is a slow growing variety with incised silvery green foliage and pink flowers in June and July. Unusually, the flowers are scented! It will only reach about 30 cm in height, and not much wider. It is a native to Southern Turkey and hardy to minus 15C, and typically thrives on dry stony hillsides, and so is ideal in smaller gardens, and will happily cope in our drier summers. It sends up little plants around itself but is never a nuisance. Same as the above but with slender silvery leaves with no lobes. This plant was found in Kenya and seeds collected germinated readily. The leaves are very spiky and the flowers are a fantastic violet. 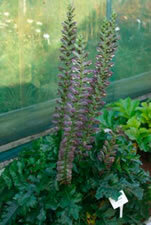 Not very hardy so far in this country but maybe when we have a larger plant it may behave like A. sennii. This is a clump-forming perennial with spiny, lance-shaped, dark green leaves and racemes of pale yellow to greenish white flowers with hairy, spiny, yellowish green bracts in late spring to midsummer. In shade it is a much larger plant. 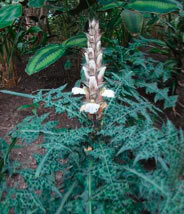 This is a small acanthus with compact flowering spikes of yellowish white flowers with reddish brown bracts and short, very spiny foliage. 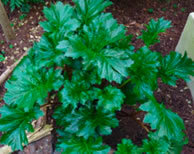 The leaves are quite long and somewhat wayward, and the plant makes an attractive clump. The plant stands around 45cm high. It makes a much larger plant in shade. Very floriferous plant with large basal leaves. This is a deciduous species which can reach 90cm wide, and 90cm tall. 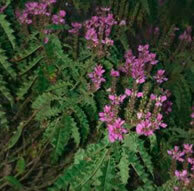 It has deeply lobed light-green foliage, and tall spikes of soft lilac flowers freely produced in late summer. Fragrant, it smells of roses. Superb variety from Beth Chatto’s garden, bearing dozens of 120- 150cm spikes of white flowers with mauve bracts in late summer. Boldly cut leaves. Introduced into English gardens in 1548. This is an architectural plant that’s justifiably popular. 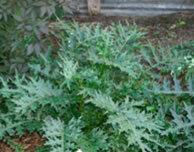 It is semi-evergreen, and produces enormous, jagged, deep green glossy leaves up to 90cm long. In mid- summer, spectacular spikes of white flowers with purple hoods shoot up from the foliage and last for several weeks. 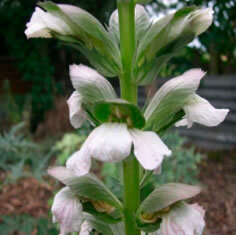 It thrives in dappled shade or full sun. Spring foliage is golden green, often darkening later in the season. 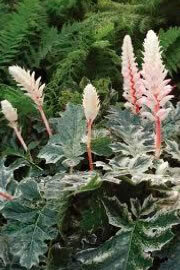 Slow growing when young but a magnificent foliage plant once established. 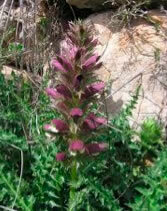 Flowers are typical Acanthus purple and white. 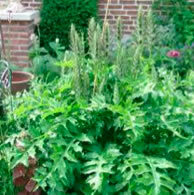 This has the largest leaves of all the Acanthus we have. Both the leaf stalk and the leaf itself are enormous! Flowering is not always as good as some other varieties. (syn. mollis Albus syn. 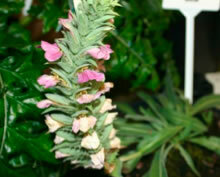 mollis Jefalbus, syn. Jardin en Face) Rue Ledan seems to have multiple personalities but all the synonyms refer to the same plant! 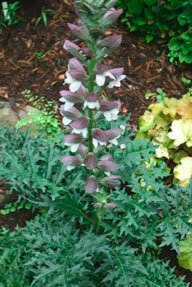 Unlike most of the other Acanthus, it has white flowers with a green hood. It is evergreen, and the flowers are scented. This is another variety where there is some debate as to whether it really is different from the species. The leaves are supposed to be a much darker green but this may just be due to growing conditions. Supposedly different form A. mollis by having large leaves shaped like oak leaves but we have never been able to source it. 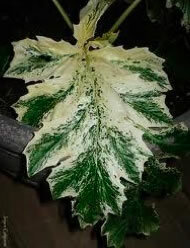 This is variegated Acanthus is listed by Cottage Garden Flowers (Bob Brown) but when we had a plant, it quickly reverted to green. 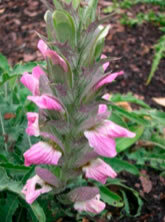 This unusual selection of the European Acanthus mollis comes via a gardener in Tasmania. The bold-textured, dark green leaves with deeply scalloped edges are highlighted by an irregular border that emerges creamy gold, and then changes to white as the leaves mature. The older leaves eventually lose most of the coloration. When the 90cm wide deer-resistant clumps mature, they are topped with 150cm tall spikes of true pink flowers…simply stunning! Sun and a rich, moist soil is preferred. 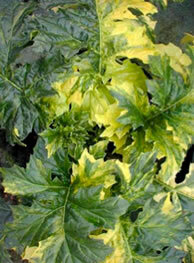 A vigorous, variegated Acanthus with striking bold leaves margined and splashed with white. 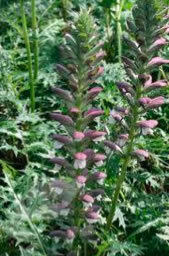 120-150cm tall highly ornamental flower stalks of pink and cream emerge in summer. Bred with A. Summer Beauty conferring vigour, more hardiness and heat/humidity tolerance than other variegated cultivars. Another Kenyan plant making a large spiny shrub but this time with bright cerise flowers. Leaves are spiky but with a downy surface. Native to Ethiopia, we have) found sennii to be hardy in this country. 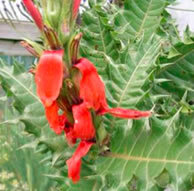 It has very prickly holly-like leaves, as well as having scarlet flowers. A real head turner! The larger the plant, the hardier it seems to be. This is the “story” of this plant! 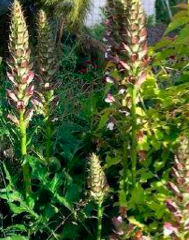 One day Sjaak came to visit with the story that he was on holiday in southern France at an abandoned farm and had found an Acanthus with stems of at least two and a half metres. Intensive research made has now learned it is probably a subspecies, A. laterifolius mollis. Origin is the coastal area of southern France and the Iberian peninsula. Introduced into English gardens in 1629, this species has deeply cut leaves which are more or less deciduous and tend to form a dense carpet. It covers an area of about 90cm, and can get to 120cm tall. 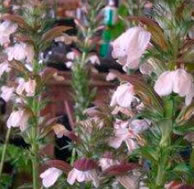 It has the trademark mauve and white flowers. This is an unusual variety with dark green leaves, heavily laced white in spring although not as showy later in the summer when the leaves become greener. Flowers dusky purple and white, reaches about 60cm in width, and 100cm or so tall. Deeply cut, but not spiny leaves. Reaches about 120cm, with a spread of 100cm. Beautifully scented flowers with spiny bracts. Named Royal Haughty, I have been reliably informed that it was named after the RHS! 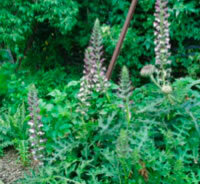 This plant has very long spikes of widely spaced purple and white flowers in late summer, around 100cm tall and wide. Seed pods look like dates. Introduced into English gardens in 1629. Rather shy to flower, but beware of the extremely prickly foliage that makes holly look innocuous! A very handsome foliage plant. Slow growing.